The next-generation Infiniti G sedan is nearing production, and our shutterbugs in Germany have caught it undergoing testing near the Nurburgring. These are the latest shots of the 2014 Infiniti G37 taken near the Nurburgring. Heavy black-and-white camo obscures the shape, but we can still make out the raised hood, crescent-shaped C-pillars and pinched grille shape that&apos;s characterizing the latest generation of premium Nissans. 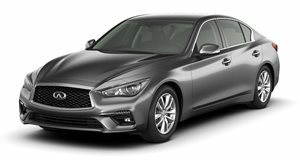 A recent collaboration between the Renault-Nissan Alliance and Daimler will mean certain components - potentially including the engine - will be shared with the 2014 Mercedes-Benz C-Class. The 2.1-liter four-cylinder diesel engine from the GLK250 BlueTEC is expected, as are upgraded and hybrid 3.7-liter V6 units and perhaps a turbocharged engine for IPL version. The sports sedan is expected to arrive first, sometime in 2013, with a coupe and convertible to follow in hot pursuit of BMW market share.